Today I tackled one of my “To Do” jobs I have been meaning to get to for quite a long time. Back in the days before CD’s and my beloved IPOD I had (as most people did) heaps of cassettes. Even though I haven’t listened to any of them for years I just couldn’t bring myself to throw them away. So today I sat down and worked which songs I really liked and wanted to listen to in the future and spent a nice relaxing afternoon downloading songs onto my IPOD. Mission accomplished!! I now have no cassettes sitting around and lots more songs I will actually listen to now. It is such a wonderful cleansing feeling when you 1. Complete something from your “To Do” list and 2. Clear out some clutter that is holding you to the past. While I was in Cairns wonderful Michelle of “Joy Express” brought a group of us girls together to participate in a week of “Finish What You’ve Started”. As I was away on holidays I couldn’t actually finish things at home that I had not completed, so I decided to complete activities I had wanted to do for a long time. We all had a very productive and very different from each other week. I have not actually met all of the girls that participated but feel I have made new friends throughout the process. I ordered myself some beautiful smelling candles. That's awesome that you're getting to things you want to get done Davine. I need about two weeks of doing that same sort of thing! Sounds like the candle party was wonderful and I love the photo of your tropical plants. Yay for you, getting something done that sits and haunts. I think we all have "ooga, booga" chores that should have been done ages ago. I am so pleased for you. It is a super feeling to be finished with one of those. Scents are so seductive to us. I love incense, candles and soaps. I am a fiend for Wicked Soaps on Etsy, she has the most delicious scents. My fav, like no one would guess is Dirty Dreaded Hippie. Smells like every head shop I have ever been in. Takes me back to the 60's. 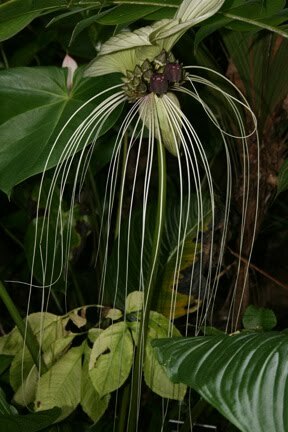 The tropical flower is awesome-- I've never seen anything like it before. I'm a big scented candle fan. I hope you enjoy yours.